The ubiquitous Apple iPod has pretty much taken over the world. 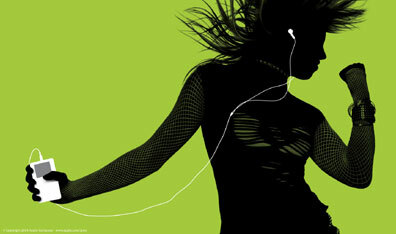 There are at least three versions of the main iPod and the device has become synonymous with “portable music player”. Many people say that it’s the best player out there and that they can’t live without their iPod. However, the iPod was not the first device to play portable music. In fact, the device that was the first digital audio player celebrates its 10th anniversary this month. Let’s rewind back to that much more innocent time, 1998. Ten years ago, there was no iPod, no iTunes and only one digital audio format, MP3. The MP3 music encoding standard was developed by several different labs including Phillips and Bell Labs. This encoding went public in the mid-90s and with it’s ability to encode/compress large music files down to very small file sizes it would become extremely popular with the tech/audiophile crowd on the early internet. Nullsoft would release it’s WinAmp MP3 player in 1997 which would make MP3 encoding/playback available to the masses and caused the format to explode into the mainstream. I remember first being introduced to the MP3 format and the WinAmp player in 1999. I was consulting in Tampa, FL and this guy burned me a CD of thousands of songs that I could just drag and drop from the CD to the WinAmp window and play on my laptop. The sound quality was unbelievable. I wondered when I’d have a way to listen to it in a portable device like my old Sony Walkman. What I didn’t realize was that my idea had already been created. 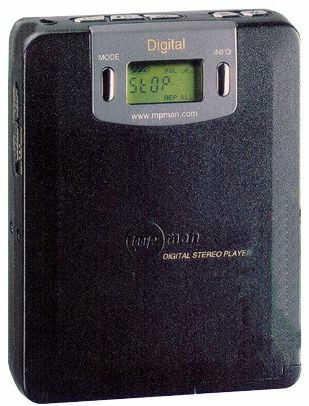 Roughly a year earlier, in March 1998, Eiger Labs imported the MPMan F10 from Japan, the first solid state portable audio player. It had only 32Mb of memory (by comparison, the iPod Shuffle has at least 1024Mb of memory) but if you sent it back to Eiger with 70 bucks, they’d up it to 64Mb. It, of course, would only play MP3 files because that is the only digital audio format that existed at the time. Despite being deceptively small, the MPMan F10 was not well received. A few months later Rio would release the PMP300 which would garner much better public opinion and sold fairly well. Both devices ran on regular AA batteries and needed replacing often. It was these two devices that helped usher in the age of digital music until the release of the Apple iPod’s 1st Generation player in October 2001. This first generation iPod didn’t have the click wheel (or Touch Wheel) we have all become so familiar with as that particular feature wasn’t introduced until the third generation of the iPod in 2003. I remember the first iPod back then but I was unimpressed with them due to many technical problems, the most prominent being severe battery malfunctions. And since the battery was sealed inside, you had to return the entire unit for repair. 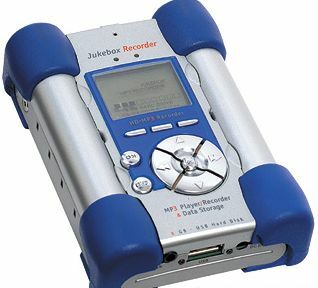 Instead of buying the brand spanking new iPod, I got the Archos Jukebox Recorder (pic below) for my birthday in May 2002. At the time, Apple had only just released the 10Gb iPod in March 2002, but the Archos Jukebox had a 20Gb hard drive and it was only about 100 bucks more (for quadruple the memory). Since iTunes wasn’t the online force it is today, buying the Archos was an easy decision. I was actually getting most of my music from Napster or Kazaa anyway so I had a ton of MP3s built up ready to load onto my new music player. I was set. This player served me well for almost 3 years. I not only used it to store my music files, I also kept a lot of work/personal files on it while I was traveling as a consultant because there was so much room. There were problems with it though. The interface was clunky and nowhere near as elegant as Apple’s (and it tended to freeze requiring a reboot). The player itself was bulky and heavy. In 2005 I started running for exercise and using this player was like carrying around a paperback book made of solid steel; heavy and unwieldy. It made running long distances tough. I actually dropped it on my foot one day and I thought I broke my toe. That’s how heavy this thing is. Also, the hard drive was your traditional platter drive, so you could hear the humming like you do in a normal computer (the iPod had this also but their sound buffering is better). This thing was built like a tank. Nothing I did could break it. It still works, except the battery is pretty much at the end of it’s rechargeable cycles because I have to plug it into the wall to turn it on. 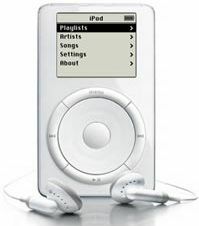 Luckily, for my birthday in 2006, I got my first iPod, the Shuffle. It’s perfect for running. Small, lightweight, easy to manipulate controls, it’s great. Makes running much more enjoyable. So wherever you came in on the portable digital audio player time line, just remember, you are enjoying the fruits of labor of many people and many years of technolgy. Apple didn’t invent portable audio players, they just perfected them (in my opinion). FAITH BEGORRAH!! I GOT ME A SHAMROCK SHAKE!! 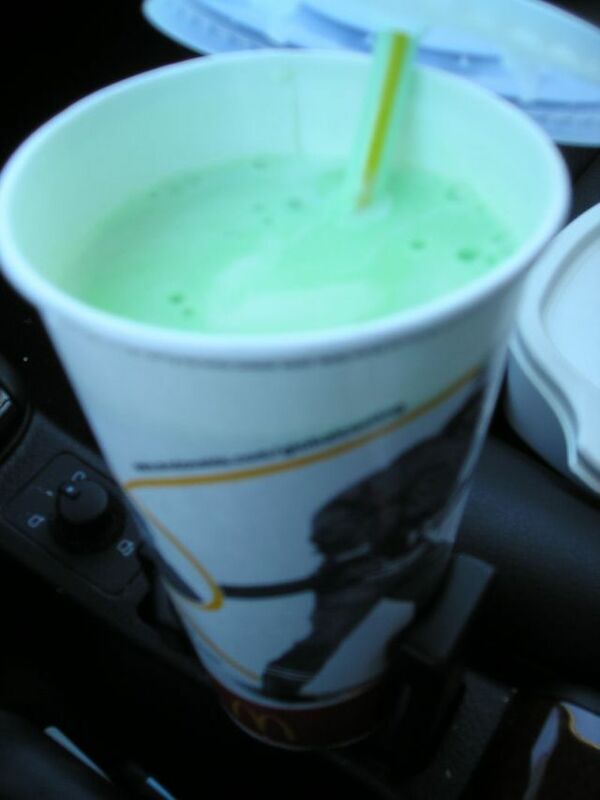 The Shamrock Shake is like the Loch Ness Monster. You either believe it exists or you don’t, some people catch a glimpse of one but some never do…and they are both green. This year, I was a lucky one. I was able to capture a Shamrock Shake and hold on for dear life as if drinking this holy liquid would grant me immortality. And judging from the taste, it may just have. The Shamrock Shake is an interesting animal. According to McDonald’s, it was introduced in 1970, which is much older than I thought. However, the McDonald’s site also says they are only available in Ireland, so, Ronald may have put a bit too much “Irish” into his shake, if you get what I’m sayin’ (In case you don’t know what I’m saying, I’m saying that Ronald McDonald put too much whiskey in his Shamrock Shake, therefore he is drunk and can’t remember the truth…). 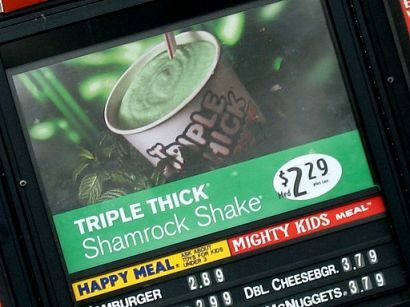 It seems many McDonald’s in certain markets across the country still sell Shamrock Shakes for a few months surrounding St. Patty’s Day. It’s the ultimate celebration of all things green and Irish. 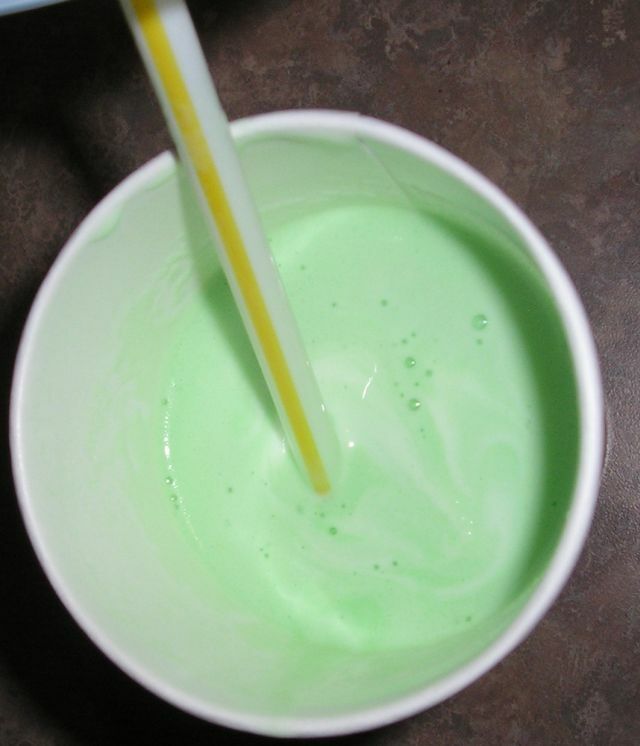 Back in the day, the Shamrock Shake got lots of publicity push. There were several commercials and they even created a special McDonaldLand character to represent it. 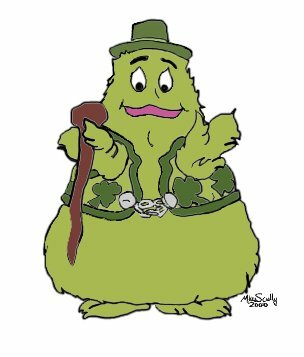 He was Grimace’s uncle, he was green and from Ireland. Behold the beautiful visage of Uncle O’Grimacey!!! I am not kidding, that was a real character. Don’t believe me, click here for Uncle O’Grimacey’s McDonald’s commercial on YouTube. You can hear him in all his fake Irish accent-y glory. 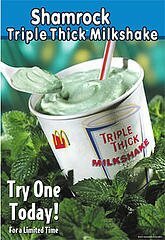 While researching a bit more, I found out that not only was there a Shamrock Shake, McDonald’s also created a Shamrock Sundae! Green, minty syrup was poured on top of a normal sundae in order to transform it into something appropriately Gaelic. 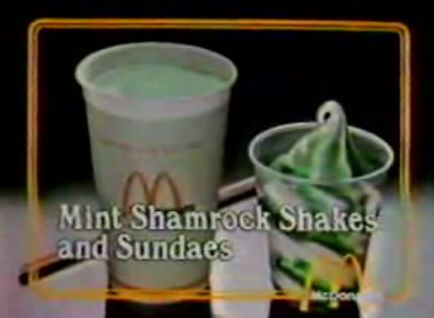 I didn’t remember the Shamrock Sundae, but there’s proof. Click here for the Shamrock Shake/Sundae commercial on YouTube, or check the picture below from that commercial. Very, very cool. I wish they still sold the sundae version. Looks YUMMY! The guy must have thought I was a loony. That was all forgotten though, when he handed me my ice cold Shamrock Shake as if he were the Lady in the Lake and I was Arthur waiting to retrieve Excalibur for the first time. Check out the awesome green-ness of this shake! It’s a sight to behold. And the taste is just as good as the pictures. It’s essentially their vanilla shake mixed with mint flavoring and green coloring…and it’s AWESOME! Everything I dreamed it would be. Try dipping Girl Scout Thin Mints into it for an extra treat. Well, that’s enough schoolgirl gushing about a minty green milkshake. Hope you are successful in finding your Shamrock before, or on, St. Patty’s Day! I’m sure my friend Collier will try to order his with that fake Irish accent that he thinks sounds like Colin Ferrell but really sounds like Will Ferrell impersonating a leprechaun. Hope everyone has a great St. Patty’s Day. And go find your Shamrock Shake!! While watching tv my wife and I came up with some life lessons that had been taught to us by tv and movies. I posted the first five earlier but we came up with another five. Learn these lessons now, that is what TV and movies are for, to teach you things you can’t learn on your own. In case you missed the first part, you can find it here. This is a quick entry today, I have another one scheduled for Friday that has to do with St. Patty’s Day (which is on Monday, I know). Everyone buys the same thing at the grocery; leafy green lettuce and a long loaf of french bread that sticks out just so from the top. And everyone gets it in a brown paper bag. Everyone has that one friend/drinking buddy that does nothing but speak in funny/snarky one-liners. The friend has no shame and hits on anything that moves. If a guy’s best friend is a girl who’s secretly in love with him, the guy will not even notice her as a prospective girlfriend and only think of her as “one of the guys”. Oh, she will always be hot. If a girl’s best friend is a guy that’s secretly in love with her, the girl will not even notice him as a prospective boyfriend and only think of him as “a friend”. Oh, and he’s always kind of a dork. No matter where you are going, if you have to drive there, you will find a parking spot right in front. Even in New York, Chicago or Los Angeles. 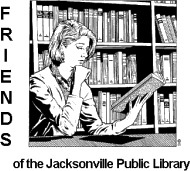 This past weekend was the Friends of the Jax Library Book Sale. They hold it every year at the Jacksonville Fairgrounds. It takes place in a giant expo building filled with boxes and boxes of books that the library no longer needs. They sell them off on the cheap to raise money. Paperbacks were fifty cents, softcovers were one dollar and hardbacks were 2 dollars. Not a bad deal. When my wife and I went on Saturday afternoon I thought everything would be picked over leaving nothing but old cookbooks and Self-Help guides. Suprisingly, even though the sale started late Thursday and continued all day Friday, there was still PLENTY of books to be searched and picked through by late Saturday afternoon. I was very impressed. I love going to book fairs and looking through old stacks and boxes of books. Old book stores, flea markets, garage sale stores, book fairs, you name it, I can get lost for hours (ask my wife). So for me, this book fair was a blast. I love seeing all the old, outdated manuals and reference books, as well as the cheesy romance and fiction novels that have become anachronistic. You can find awesome old computer books for machines that haven’t existed in at least ten years next to paperback novelizations of movies from the late ’70s. The wide spectrum is what makes it all fun. Beaches II – I’m not surprised that the Jacksonville Public library is trying to sell off its back stock of this Beaches sequel. What does surprise me is that I only found one copy in the bins to be sold. I expected crates of this book to be trucked in and dumped in the corner, given free to anyone that happens to walk past. 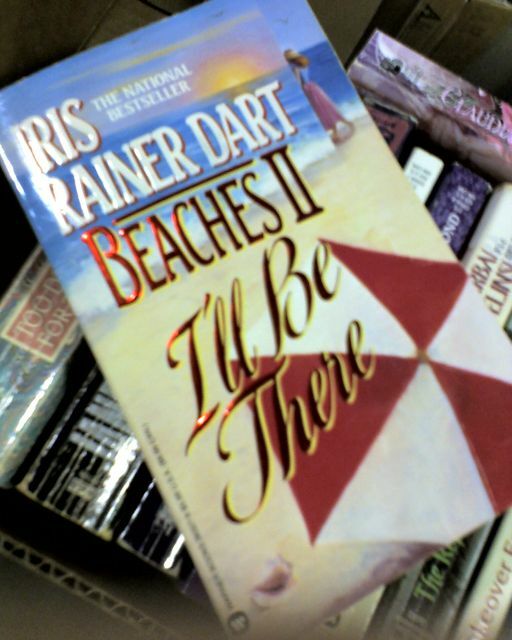 Originally published in 1991 as just I’ll Be There, this was Dart’s sequel to the tear-jerking, my mother loving, Beaches. It picks up right after the movie/book and gives us another 300 pages of sappy torture as CeeCee tries to raise her dead friend’s (and did you ever know? she’s her hero) daughter. Beaches II: I’ll Be There…now playing, in my worst nightmares.